Travis Hallden Holt is a former U.S. Navy surface warfare officer and veteran of the Persian Gulf War. He's worked the past twenty-two years in the corrections side of law enforcement, first in the prison system, then in the streets as a probation officer. He spent three years supervising felons in a south Atlanta neighborhood ranked the ninth most dangerous neighborhood in America, where one in every twelve residents becomes a victim of crime each year. For years, his interests were in weaponry (both small arms and large scale), warfare tactics, hand-to-hand combat, criminal justice and unsolved crimes. But life has a way of molding perspectives, and Travis came to realize the physical world known to the five senses didn't have all the answers. It scratched the surface at best. Accordingly, Travis's interests shifted to supernatural phenomenon, spirituality, the mysteries of life, the invisible world beyond our five senses and the forces that lie therein. He's still a peace officer, but one who has mingled with psychics, mystics, mediums, energy healers, shamans, gurus, artists and denizens of the "underground." Travis is the author of Unholy Bargain, a supernatural thriller published by Double Dragon Publishing. 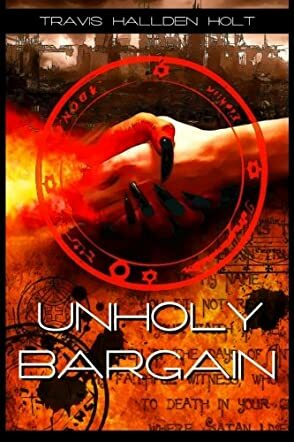 He resides in Atlanta, GA.
Unholy Bargain by Travis Hallden Holt takes us into the story of a brilliant assassin, a man whose body turned to dust some time ago but he is still doing his work through his spirit. He can't be detected and when he finds a mark, he simply takes on a human host and does his work. While Sheriff Nate is seeing a woman named Kaitlyn Spencer, he really enjoys their new relationship, but when her life is threatened and it comes to light that she believes in spirits and otherworldly terrors that Nate does not, things just get more interesting. Can Nate save her? I read a lot of supernatural books and this is by far one of the more interesting takes. An assassin that continues with his work after death by taking over other bodies? Brilliant idea! Along with that great idea, author Travis Hallden Holt has put together a good, flowing story that is part supernatural and part crime thriller and just one great book. Nate and Kaitlyn are a fantastic pair, although to me they seem like a little bit of an odd couple, but I love that about them. She believes in the supernatural and he doesn't ... until he is forced to. Along with being entertaining, this book makes you ask: what would you do if your world view was forced to change? If you, like Nate, didn't believe in the supernatural, but someone you care about was being threatened by that world? Could you change your mind and go on fighting? I love a book that makes me think! I recommend this one.